What's the default way of accessing specific folders in the Windows operating system? The majority of users will probably answer that question by stating that they browse to that folder in Windows Explorer. Some may have put shortcuts to folders on the desktop or the start menu, and advanced users may make use of application launchers that support folder links. Still, the majority of users makes use of the default way of opening folders. The problem? It is not really comfortable, nor fast, especially if the folder is hidden deep in the file system. Chameleon Folder offers a free alternative. The program puts a custom folder menu at your fingertips. Holding down the keys Windows and Z opens it anywhere on the desktop, so that the configured folders can be accessed directly and without slow downs. 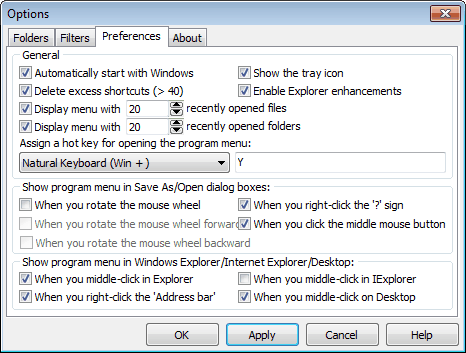 The menu opens as well if the middle mouse button is clicked in Explorer, or on the Desktop. The folders that are displayed to the user are customizable, as are the keyboard hotkey and other settings that define visuals and program functionality. New users should start by opening the program options. This can be done by pressing Windows-Z and selecting options from the menu, or by right-clicking the system tray icon and selecting options. The folders that are displayed to the user are configured in the first tab of the option's menu. 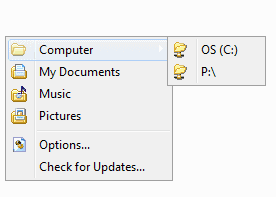 Here it is possible to configure menus and folders that are displayed when the folder menu is opened. Folders can be placed in the root level, or in menus. The program pre-configures all drives and user folders so that these are already accessible after installation. The Preferences tab configures the program further. It is possible to configure when and how the program menu is shown in Save As and Open dialog boxes, in Windows Explorer, Internet Explorer and the desktop. Filters can be configured that offer fast filtering of files in Save As and Open dialog windows. Chameleon Folder is an unobtrusive, helpful program for the Windows operating system, especially for users who work regularly with specific folders in Windows Explorer. It is not the most lightweight of programs but still acceptable for most computer systems. The software is available for 32-bit and 64-bit editions of Windows. Downloads are provided at the developer website. I use Direct Folders (Pro version) and have set the keyboard shortcut Win + Q to bring up a menu of my frequently accessed folders and files. It has useful additional features like ClickSwitch. Thank you Shenley. Folder Menu looks indeed superior in every way to Chameleon Folder!